Ready to upgrade? Your old hot tub could have a trade-in value that you could apply toward the purchase of a new Hot Spring spa. With more powerful jets, state-of-the-art water care options, advanced energy efficiency, plus a comprehensive new warranty, now could be the perfect time for a brand new Hot Spring spa. Why Trade Up? Does Your Old Hot Tub Have This? New Hot Spring spas are available with advanced water care options. The ACE Salt Water Sanitizing System require less effort, so you can enjoy more time relaxing in your spa. It uses a special diamond electrode and a small amount of salt to keep your spa water clean. 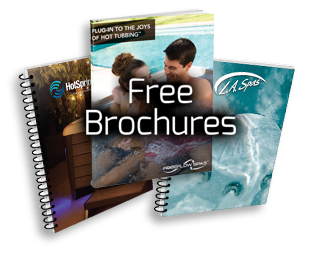 Add wireless entertainment options to any new Hot Spring spa you choose. With a Wireless TV and Sound System, you can transmit your favorite show or virtually any audio source from your home to your spa. Do you love your Moto-Massage jet? You’ll love the Moto-Massage DX jet even more. Imagine two streams of warm water sweeping up and down the length of your back. This revolutionary jet is one of the many unique jets available from Hot Spring Spas.